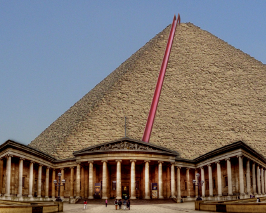 The British Museum is pleased to announce that this summer visitors will be able to view one of the Seven Wonders of the Ancient World as it plays host to the Great Pyramid of Giza. This is the first time that Egyptian authorities have loaned out any of its pyramids, although Disneyland Paris did borrow the Sphinx for six months back in 1998. Members of the public will be able to explore many of the hidden chambers for themselves and museum guides will be on hand to explain how the pyramid was constructed, provide details about some of the extraordinary treasures found within and help visitors avoid the fiendish death traps that were built into the structure. There will also be plenty to occupy the children, with interactive displays, costumed re-enactments and a big slide from the top.